A low-level CIA employee returns from lunch to discover that everyone in his office has been killed; on the run, he goes on to pursue the truth about who is behind the murders while continuing to dodge the hitmen who are after him. 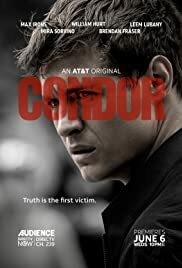 Condor is an American television series based on the novel Six Days of the Condor by James Grady and its 1975 film adaptationThree Days of the Condor written by Lorenzo Semple Jr. and David Rayfiel. The series was created by Todd Katzburg, Jason Smilovic, and Ken Robinson and premiered on June 6, 2018 on Audience.